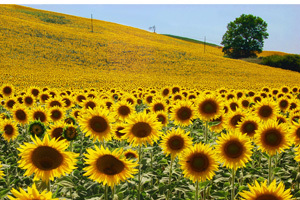 West of Sienna, sunflowers paint the softly rolling hills as far as the eye can see. The road dips and sways through the Tuscan landscape, with shoulder high banks that rise to either side. Swallows glide on late afternoon thermals in the clear blue sky. At an opening to one field a man holds up cars to let out a tractor pulling some leviathan farm implement. As traffic slows to a crawl behind it, I roll down the windows to let in the hot herb-infused air and crank up the tunes on the local radio station. Bambino Nel Tempo was the favorite Italian song that summer, played every hour without fail. Although Eros Ramazzotti’s words came too fast for me to capture their full meaning, I delighted in picking out highlights. Felicity, fantasy, the stages of life: the intoxicating Latin words washed over me and swirled through my senses. I could just about sing the refrain, usually to the horror of my children. Now here I was out on my own, with a million sunflowers as my only audience, and so I sang with the gusto of an operatic tenor. In that moment, I was about as Italian as I’ll ever hope to be. At the Coop in Sovicille, I popped in my coin to release a shopping cart. There in the cool recesses of the market were masses of tomatoes, piled high in their boxes. Four or five types of tomato, every one picked at the peak of flavor and all from farms within 20 miles, with provenance clearly labeled on yellow signs. I donned plastic gloves and rubbed shoulders with the Italians, who inspected and selected and carried their treasures to the weigh station with pride. 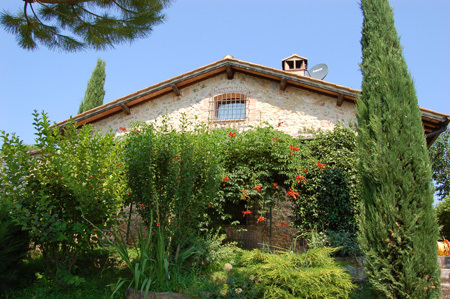 Back at our little rented villa, the kids splashed in the pool while I unpacked my goodies: fresh local cheese, fresh pasta, and eggs so fresh they might have been squeezed from a chicken only that morning. Oh, and about 5 pounds of lovely tomatoes. When she saw my haul of tomatoes, the Salad Queen’s eyes got wide with anticipation. That night we made lasagna that just couldn’t be beat. Fresh tomatoes sprinkled with olive oil and then layered with noodles, buffalo mozzarella and béchamel sauce. A meal fit for a king. I gave one last Italian gesture, only a little deflated, and headed back to the kitchen. 2. Start the béchamel sauce (below) and do the next steps at the same time you’re working on it. Ideally, by the time you’ve finished the béchamel all the components of the lasagna will be ready. 3. Slice 8 ounces of Buffalo mozzarella (or other fresh mozzarella) into ¼ inch pieces and sprinkle lightly with salt. 4. Slice the tops and bottoms off of the tomatoes and discard or reserve for another use. Cut the rest of each tomato into ¼ inch rounds. 5. 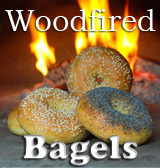 Put 5 cups of hot water (not boiling) into a loaf pan or casserole and slip the no-boil noodles in one at a time. Let noodles soak for 15 minutes. A layer of uncooked tomato slices. Drizzle with olive oil and sprinkle with salt and oregano. Continue the sequence with remaining noodles and filling, finishing with a layer of tomato slices drizzled with olive oil and sprinkled with salt and oregano. 7. Bake at 375º for 40-45 minutes, until béchamel has puffed up and the edges are bubbling. 8. Let cool for 15 minutes before serving. To make the béchamel sauce: Melt butter in a quart-sized saucepan over medium heat. Once the butter is barely melted add flour and whisk with a wooden spoon. Add a few tablespoons of milk, mix it in, and then add a few more. Now add small amounts of milk, an ounce or two at a time, and let the milk get hot before you work it into the roux. Be sure the previous batch is fully incorporated and the sauce is smooth before you add more milk. Once you have successfully added all the milk and the sauce is hot and smooth, add the salt and pepper. Cover tightly with a lid and set aside until ready to use. Just before building the lasagna, beat an egg in a small bowl. Add a small amount of sauce, whisk the sauce and egg together, and then add a bit more sauce and whisk again. Now add a quarter cup of sauce and whisk it in. Add the egg mixture back to the pan and whisk thoroughly. Tomato note: Use the freshest, peak-of-season tomatoes you can find to make this lasagna; it will make all the difference. Good heirloom tomatoes will work, and if a farm nearby you sells tomatoes, they’ll more than likely be worlds apart from storebought. If you have homegrown tomatoes, even better! The tomatoes on my vines here in Seattle are only beginning to ripen, so I used some decent tomatoes from a farm in Wenatchee. I let them sit for 2 days in order to fully ripen. Music note: The song I refer to is track 3 on Eros Ramazzotti’s Calme Apparente (©2005 Sony BGM Norte). This album, which has some very strong songs including the superhit ‘La Nostra Vita,’ is in my CD player more often than not. Except for track 11, I’d recommend it to anyone. Track 8 – Nomadi D’Amore (literally, ‘Nomads of Love’) – has become one of my favorite songs. that looks incredible! so juicy and fresh and delicious. i could definitely use a slice right about now! 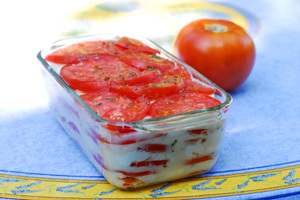 This lasagna is so fresh, and the colors of the tomatoes are so alluring! I’ve never made lasagna this way, but you’ve inspired me to go ahead and try! I enjoyed your post, your writing is so vivid. I checked out those songs on iTunes to get a feel of what you were happily belting out in your car. Are you an Il Divo fan (luv those guys)? That field of sunflowers is spectacular. I could stand there in awe for hours. This tomato lasagna is absolute fresh perfection. That is a pristine image you took of it and the neatest stack of lasagna noodles I’ve ever seen. The photo alone is edible. I am so making this! Lovely! The more tomatoes and sauce the better. Thank you for the beautiful photos too! Loved this post Your writing is so descriptive and these lasagna looks perfect. My layers always slump together and end up looking like a mess! Your lasagna is beautiful. It looks so refreshing and perfect for summer! This is just beautiful. I have never seen a more perfect lasagna. Could this be another Top 9 post?! Sounds great. The use of fresh tomatoes is truly inspired. Will have to try this one! Wow! Your lasagna looks absolutely beautiful. I have never tried making one. Hmmm one day….Thks for recipe. Wow. I made a lasagna over the weekend. Didn’t look anything like yours. I’m jealous! Fantastic!!!!! I can’t wait to make this at home! This looks completely amazing ..
Oh wow. I am going to make this sometime this weekend. It sounds almost too good to be true! Congrats on the Top 9-what a beautiful photograph! This looks amazing! 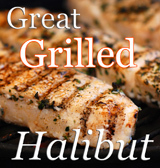 I’m absolutely trying this recipe – maybe even tonight. That looks totally amazing. Like no lasagna I have ever seen. Wow. Can I have a slice? Wow..this looks good. Amazing photo!!! This lasagna looks amazing. Beautiful picture too! Amazing lasagna!! My son has recently asked me to make some… the two of you have inspired me! Loved your narrative. Congrats on the top 9! ‘Looks divine! As I’m a single eater here I can make them in small individual casseroles and take for my lunches @ work or a ready made supper in the week. Yummy! Thanks for posting & Congrats on Top 9! Your lasagna looks wonderful. I have never made one like this before…..with some fresh basil it would be like the Caprese appetizer. Aah.. I love Italy, cooking and listening to Italian music takes me back. I look forward to trying your lasagna. It looks sooo fresh. And buffalo mozarella is divine. This is a beautiful lasagna!! I am sure it was fantastic tasting. This picture reminds me most of Italy. I can’t quite remember the lasagna.. But I do know it tasted good at home! Petals unfurling in the direction of the sun. Happily waving to us are we pass by. Reaching up to touch the soft blue sky. I am jolted back to reality. Nothing better than Fresh this is wonderful! WOW! Beautiful! 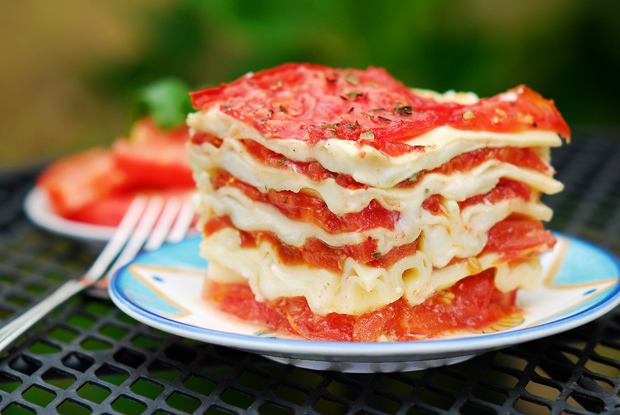 Can’t wait to try this…my lasagna has never turned out with such pretty layers like this. Once again you have come through with an awesome recipe. I will have to use eggplant instead of pasta (due to dietary restrictions), but I’m sure it will taste phenomenal. Made this yesterday, and love it. I’m making more today with tomatoes that I have and want to eat up. I made this lasagna on Saturday and we loved it. I soaked the Barilli noodles but they stuck together it was a pain. Any clues please? I am going to do a post on it on my blog. Made this recipe tonight and it came out delicious!!! Thank you for posting. Great recipe. Was looking for something to do with the San Marzano’s from My garden!! @gilli….Do not soak them. I didn’t and it cooked great!!! This was delicious! I did not soak the noodles. It turned out perfect. This is a new favorite for my garden fresh tomatoes. Thanks!